My CV and List of Publications are available online. Here are links to the most frequently viewed posts on this blog. Visitors might also be interested in the following series of posts. Please just follow the thread on the archives. When was the first reference to semi-presidentialism? What was the first semi-presidential country? This entry was posted in Historic cases of semi-presidentialism, List of disputed areas and other territories with semi-presidential constitutions, List of president-parliamentary and premier-presidential countries with dates, List of presidential, parliamentary and other countries, List of semi-presidential countries (current), List of semi-presidential countries (historic) on 29 March, 2018 by Robert Elgie. This new dataset provides time-series, cross-sectional data for the presence of both semi-presidentialism and the two sub-types of semi-presidentialism – premier-presidentialism and president-parliamentarism – since 1900. The dataset uses the same country names, country years, and country ids. as the V-Dem data set, allowing them to be easily merged. The dataset (v2.0) is available here. There are two codings of semi-presidentialism in v2.0. In sp1, semi-presidentialism is defined as the situation where a country’s constitution establishes both a directly (or popularly) elected president and a prime minister and cabinet that are collectively responsible to the legislature (Elgie 2011). This coding includes cases where a constitution requires a super-majority for the dismissal of the prime minister and cabinet by the legislature. In sp2, semi-presidentialism is defined as the situation where a country’s constitution establishes both a directly (or popularly) elected president and a prime minister and cabinet that are collectively responsible to the legislature by no more than a vote of an absolute majority of one or more houses of the legislature. In other words, this coding excludes cases where the PM and government can be held collectively accountable only through a super-majority vote in the legislature. In sp1, the following countries are classed as semi-presidential, whereas in sp2 they are not: Algeria (all years), Burkina Faso (1977-80), Burundi (1992-96), Cameroon (all years), Central African Republic (2016), Egypt (2007-11), Kyrgyzstan (1996-2007), Madagascar (all SP years since 1996), Mali (all years), Republic of Congo (2016), Rwanda (all years since 2003), Togo (all years), Tunisia (1989-2001), and Vietnam (all years). The presence of semi-presidentialism (both sp1 and sp2) is coded as 1, its absence as 0. The start year is the year of the introduction of semi-presidentialism in the constitution if the date is on or before 30 June. If the start date is 1 July or later, then the following year is recorded as the first full year of semi-presidentialism. The end date is recorded for the year that the constitution ceased to be semi-presidential at whatever point in the year it ended. The end of semi-presidentialism is marked by a constitutional change. This can be a constitutional amendment introducing another type of system, or a suspension of the constitution. President-parliamentarism is a sub-type of semi-presidentialism where the prime minister and cabinet are collectively responsible to both the legislature and the president. Premier-presidentialism is a sub-type of semi-presidentialism where the prime minister and cabinet are collectively responsible solely to the legislature. These sub-types were first identified by Matthew Shugart and John Carey. The above definitions are consistent with Shugart and Carey (1992). In the dataset, pp1 and pp2 code premier-presidenetialism as 1 and president-parliamentarism as 2. If a country is not semi-presidential, then the coding is 0. All pp1 codings are based on the definition of semi-presidentialism in sp1. All pp2 codings are based on the definition of semi-presidentialism in sp2. If there are any mistakes, then please let me know (robert.elgie@dcu.ie). If there are any questions, please contact me at the same email. 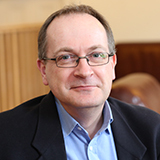 Robert Elgie (2018), Semi-presidentialism, premier-presidentialism and president-parliamentarism – A new country-years dataset [Blog post, 3 April]. Retrieved from http://presidential-power.com/?p=7869. 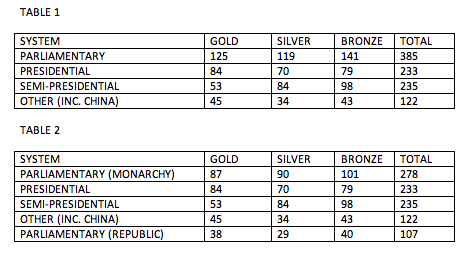 Elgie, R. (2011), Semi-presidentialism: Sub-Types and Democratic Performance, Oxford: Oxford University Press, 2011. Shugart, M. S. and J. M. Carey (1992), Presidents and Assemblies. Constitutional Design and Electoral Dynamics, Cambridge: Cambridge University Press. This entry was posted in List of president-parliamentary and premier-presidential countries with dates, Semi-presidentialism and tagged dataset, premier-presidentialism, president-parliamentary, semi-presidentialism on 29 March, 2018 by Robert Elgie. 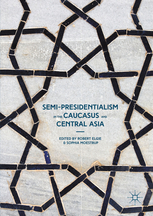 This entry was posted in Semi-presidentialism and tagged Caucasus, Central Asia, semi-presidentialism on 1 June, 2016 by Robert Elgie. Over at Presidential Power, Lydia Beuman argues that Timor-Leste is a clear case of a premier-presidential form of semi-presidentialism. Absolutely right! 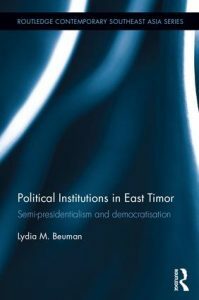 Lydia’s new book on semi-presidentialism and democracy in Timor-Leste is now out and is a must read. This entry was posted in Timor-Leste and tagged premier-presidentialism, Timor-Leste on 11 May, 2016 by Robert Elgie. This entry was posted in List of disputed areas and other territories with semi-presidential constitutions on 9 March, 2014 by Robert Elgie.